Download Preschool Welcome Pack and Registration Form. For information about availability of places, please contact us on (01223) 309066 (Wednesday) or [email protected]. 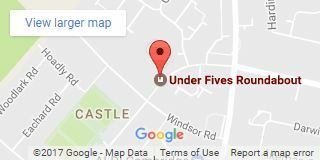 The Under Fives Roundabout preschool is open each weekday during term-time between 8:40 and 3:10 in our own building adjacent to Mayfield Primary School, Warwick Road, Cambridge. All children can attend flexible hours but those in their preschool year must attend from either 9:10am -11:40am and/or 12:10pm – 2:40pm (core session times) and must attend a minimum of 12 hours (which may include a morning and an afternoon on the same day, or on two separate days). The children in the younger year group must attend a minimum of 2 sessions on 2 separate days. Session times will have been agreed before your child starts and it is important you adhere to these agreed times. Lunch runs from 11:40am to 12:10pm. Children bring their own healthy packed lunches. The preschool works within the Early Years Foundation Stage (EYFS). The main principle of the EYFS is learning through play. We provide a wide variety of open ended resources ensuring all abilities and interests are met, extended and stimulated with children inspired to learn. There are always mark making opportunities available using a wide spectrum of materials on a small and large scale. Children are encouraged to be independent in all aspects of their learning, given support where necessary and guidance to progress at their individual rate. Each of the two preschool rooms holds a structured register time on arrival in the morning and in the afternoon and within this we incorporate phonics, brief exercise and show and tell and small group key activities. As an example, such activities might consist of 4 children and one adult using a giant die, throwing it up and seeing what number it lands on, counting the spots and doing the corresponding number of jumps. To extend such an activity further another die would be introduced and the two amounts added; in addition to this the children will be asked to select the corresponding numeral. Such an activity enables the children to learn about turn taking, the effects of physical exertion, number recognition and other numeracy and social skills. Immediately after this the external doors are opened and the children can choose freely where to play, what to play with and decide whether they would like to help prepare the snack for everyone. At the beginning of freeplay some children are taken aside for targeted small group activities. We provide resources which appeal to all of the children’s interests where possible and strive to provide new and interesting experiences at Roundabout. Every session has a degree of flexibility with the staff team taking the children over to the Mayfield grounds to play football, or to visit the conservation area or play on the climbing equipment. This again is mainly according to choice, the independence of the children remains a priority, however we do encourage the children to involve themselves in new experiences. All children are funded for up to 15 hours per week dating from the term following their third birthday. You will be given relevant information and forms at the appropriate time by Roundabout staff. This is called Early Years Funding and is provided by the Council. Please note that regular unexplained absence from funded sessions may result in you having to repay the nursery education funding to the council. 30 hours funding = Extended entitlement – from September 2017 for working families. Funding will cover up to 30 hours at 38 weeks (so term time) and can be split between providers. The funding is available to children the term after they turn three years old if the family meets the criteria. Apply at www.childcarechoices.gov.uk to see if your family qualifies. If your child is not eligible for funding or if you have chosen to pay for additional hours the fees are £5.00 per hour. Fees are payable half-termly in advance. Fees continue to be payable if a child is absent. In cases of prolonged absence please consult the manager. Each child’s attendance at the group is conditional upon continued payment of fees and/or receipt of Early Years Funding. Please see our payments policy for further details, which is sent out to all new parents who are fee paying. If you would like to permanently withdraw your child from Roundabout before the final day of the summer term in July (see term dates), you must give us six weeks’ notice in writing. You will be unable to claim funding elsewhere for these six weeks. These are Roundabout policies you may find useful to access online; these and our other policies are available at Roundabout, please ask if you would like to see them.